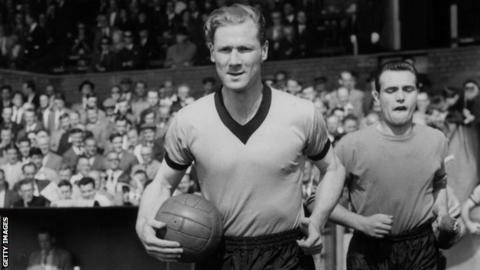 Former Wolves captain Bill Slater has died at the age of 91, after suffering with Alzheimer’s disease and illness. Slater won three league titles in the 1950s, the club’s most successful period, and also lifted the FA Cup after leading the side to a 3-0 win over Blackburn at Wembley in 1960. Slater, who earned 12 England caps, remains the last amateur to play in an FA Cup final – for Blackpool in 1951. He is also the only part-time player to be named Footballer of the Year. Slater won that accolade in 1960 while simultaneously studying for a BSc degree at university. In 2010, Slater was inducted into the Wolves Hall of Fame. and the club have said they are “extremely saddened” to learn of his passing. “Bill captured the hearts of Wolves supporters during the club’s most successful period and will be remembered with great fondness,” a Wolves statement said. The former halfback – its modern-day equivalent would be a defensive midfielder – made 339 appearances for the West Midlands club, played four times at the 1958 World Cup and was selected for Great Britain at the 1952 Olympic Games. Football was not his only sporting passion. He became president of the British Gymnastics Association in 1989 and also worked as director of PE at both Liverpool and Birmingham University. Clitheroe-born Slater, who received an OBE in 1982, and a CBE in 1998 at Buckingham Palace, was a father of four – including BBC director of sport Barbara Slater – and grandfather of eight.